Put on your socks! Your running shoes are waiting! 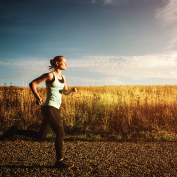 Running is a hugely beneficial way to get in whole-body exercise. It’s endorphin-rich, burns an enormous amount of calories to help with weight loss, and has a ton of community interest. It’s also something that you can do no matter what your fitness level is. To sort out which races are your speed, check out our list of local favorites and what tips you’ll need to make the training process, and race-day, smooth sailing! Kick off the year with the annual California Family Fitness Super Sunday Run. 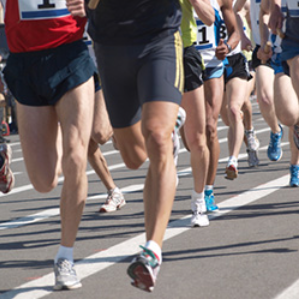 Hosted by the Sacramento Running Association, this race has something for everyone! The running course takes you from the Sacramento State campus over the Guy West Bridge, and into Hornet Stadium for a final finish. Kids can have their own race with the Pee-Wee 40-yard dash. Continue on your racing streak with the Blue Diamond Shamrock 5k, or maybe you’re ready to go big with the Half Marathon distance. To help you on your journey, Blue Diamond Almonds teams up with Fleet Feet Sacramento. Nothing says motivation like a run that benefits the Sacramento Food Bank and Family Services. KCRA-3 and KQCA host Western Health Advantage’s annual Run to Feed the Hungry on Thanksgiving Day. Over 28,000 participants ran in last year’s event and this year hopes to be even bigger! Kids and adults can enter this very charitable 5k/10k. For over 30 years, runners from all over the world have flocked to the California International Marathon. The course takes you through the Sacramento-area countryside and the towns of Orangevale, Citrus Heights, Fair Oaks, and Carmichael. The 9,000+ runners make their big finish at the state capitol. Since the race is sanctioned by USATF, it is a qualifier for the Boston Marathon and Olympic Marathon Trials. Here are some basic tips to keep in mind when just beginning a new race training program. Hydrate with water and/or an electrolyte drink one-two hours before a run, during, and after. If you are thirsty, you are already dehydrated! After a quick warm-up, take time to stretch. Keep in mind running-specific muscle groups like your hamstrings, quadriceps, hips, and even shoulders. Try not to stretch on muscles that are “cold” (without a warm-up), because it can lead to injury. Ask an expert at Fleet Feet or your local athletic store for the right shoes for your feet. Running in just any gym shoe can wreak havoc on your joints and lead to injury. Training with a faster friend keeps you challenged-especially on days when your energy is a bit lackluster. Stay positive! Set small achievable goals and pat yourself on the back as you reach them! Getting miles in builds strength, agility, speed, endurance, and coordination. Training that supports your desired race can help you progressively get stronger and faster, help you reach your projected mileage goals, and also build self-confidence. Be patient and keep trying week after week!